Aside from the large 7.8-inch 300 ppi E Ink screen, one of the coolest things about the Kobo Aura One is the fact that it has OverDrive support built-in so that you can easily download free ebooks from your public library directly onto the reader itself. Previously library ebooks had to be downloaded to a computer and transferred to the reader using a USB cable, and that’s how it still works with other Kobo ereaders. That method is a lot less convenient and it requires having an Adobe Digital Editions account. With the Aura One all you have to do is enter your library card number, no need to deal with Adobe or their crummy software. So far the Kobo Aura One is the only Kobo ereader to get onboard support for OverDrive. Since they released the Kobo Aura Edition 2 at the same time without OverDrive support, that’s a strong indication that it will be an exclusive feature for the Aura One. The Sony PRS-T1 was the first ebook reader to offer direct library downloads. I thought Kobo would implement a similar approach on the Aura One but they’ve done things completely different. 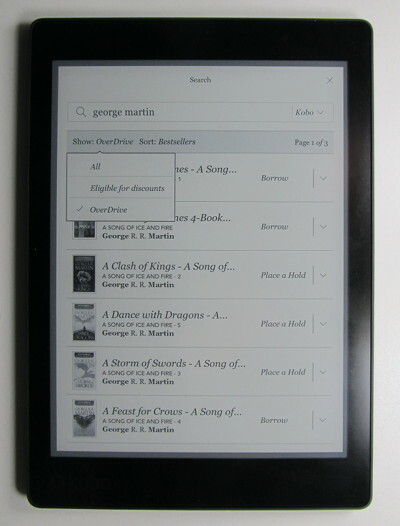 With the Sony you basically just used its web browser to search and download ebooks from your library’s mobile website. The process was about the same as using a PC to checkout library ebooks. With Kobo the process doesn’t involve using your library’s website at all. They’ve made it so that library ebooks are integrated into the Kobo ebook store. All you have to do is enter your library card number and that’s it, you’re good to borrow ebooks from your library through the Kobo store. When browsing the Kobo ebook store from the Aura One you get the option to borrow and put library ebooks on hold from the book’s description page. As first I thought this was rather inconvenient because you can’t tell which books are available through Overdrive and which aren’t without having to go to the book’s description page and then tapping the icon to show additional options. But then I found out that you can use Kobo’s search and then select OverDrive from the “Show” list on the top left and it will list titles available from your library, with the option to borrow or place a hold, depending on if the title is available or not. Unfortunately that option is not available when browsing through Kobo’s categories and genres lists; it only shows up when using search. Once you select to borrow a title it will start to download immediately and you can start reading as easy as that. The first ebook that I tried to borrow gave an error that it wasn’t available from my library, even though it had the borrow option enabled. I don’t know what the deal is with that but the second book that I tried worked without issue. Once you checkout a book on your Kobo ereader, it will show up on your other OverDrive apps and Kobo ereaders as well when synced. Oddly there doesn’t seem to be a way to return library ebooks from the Aura One once downloaded. There’s the option to remove from the reader but not return. It shows how many days until the library ebook expires on the book list page. I also saw a note that said Kobo will save your bookmarks and annotations after the book expires in case you want to get it again. One difference with the Kobo is that you cannot add multiple libraries to it like you could with the Sony PRS-T1. Currently it only supports one library account at a time, but some folks at MobileRead found a workaround by signing out of your library and signing into another one. It stores multiple accounts that way. According to other reports in that same thread you can also checkout the books from your library directly using a computer and then sync the Kobo Aura One to get them to appear that way. Overall I think the OverDrive integration on the Kobo Aura One is a really cool feature. You’d be surprised by how many good ebooks you can get through public libraries for free. If you haven’t done so before, here’s a library ebooks tutorial on how to get started. Thanks for the tip on a work-a-round for more than one library. Did not realize that would work. I download books on my Ipad from the library. Overdrive lets me see the books I have borrowed and where I am on the waiting list for other books. I’m told that once I download books on the Aura I can’t read them on other devices. And I don’t think it gives me the other features of searching, & seeing my HOLDS. Library books checked out on the Aura One show up on other devices as well. The feature is rather limited though. You can’t see how many are on the wait list, your holds, etc. Finding OverDrive books can be a bit of a pain too unless you know exactly what you’re searching for. Then sometimes I have a problem with it saying there’s an error when trying to check out or place a hold on certain books. What if you have the book checked out on your overdrive account (but not downloaded) but you checked it out from another device? I have checked out a copy of a book via the overdrive app on my phone but when I go to try to find it via my overdrive account on my Kobo Aura one, I only have the option to place a hold on the book. It’s like that connection between books checked out on the Kobo being available elsewhere is only one way. Does that make sense? If that is the case I was really hoping it would be smarter than that. It should automatically appear when it syncs but you never know with Kobo. I’ve experienced a number of problems with Overdrive on the Aura One ever since it was released and Kobo never fixes anything. Lots of times I just get an error when trying to checkout a book. A couple weeks ago it would crash and restart every time I tried to checkout a book. It really ticked me off so I haven’t turned on the Aura One since.